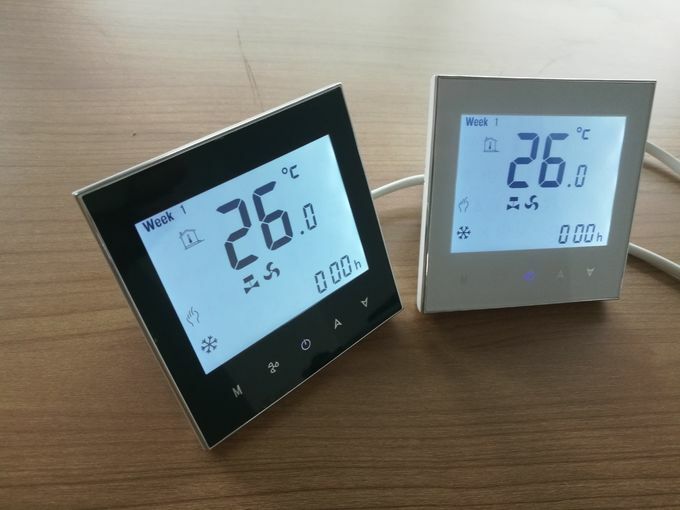 TF-703 series Touch Screen Room Thermostat. Microprocessor based thermostat with LCD display. Designed to control the fans and two wires moterized valves for chilled water fan coil unit applications. 4. Fan coil or AHU all suitable. 5. Hidden 86mm box and European 60mm round box both available. 7. Temperature for ℃ & ℉ is changeable, for more convinient temp control and setting. 8. Auto restart function available. Can memery the functions and settings before electricity off. 9. 5+2 six periods programmable maximize comfortable room temperature and energy saving. 1.Having 10 engineers handle your OEM/ODM orders. 2.Products come with CE, RoHS and ISO9001:2000 marks. 3.1 million-unit annual capacity can fill bulk orders with ease. Q1. Can I have a sample order for wifi thermostat? A: Yes, we welcome sample order to test and check quality. More detail please contact with usdirectly. A:Sample needs 3-5 days, mass production time needs 1-2 weeks. Q3. Do you have any MOQ limit for wifi thermostat? A: We usually ship by DHL, UPS, FedEx, TNT or by air or by sea. It usually takes 3-5 days to arrive. Airline and sea shipping is also optional. Airline need 3-6 days and sea shipping need 20-35 days. Q5. How to proceed an order for wifi thermostat? Q6. Is it OK to print my logo on wifi thermostat? A: Yes. When quantity is more than 200 pcs, your logo could be printed on the thermostat and app. Please inform us formally before our production and confirm the design firstly based on our sample. A: Yes, we offer 18 months warranty to our products. A: Your thermostat carries an 18 month warranty from date of purchase. Service outwith the warranty period may incur a charge. Q9. Can you do OEM and ODM for us? A: Yes. We are professional in provide OEM and ODM service.